A 2012 court settlement between retailers and the payments industry allowed retailers to pass their credit card acceptance costs onto consumers in the form of a new fee when consumers choose to pay with a credit card. Not all merchants will charge this fee so consumers should be aware that they can avoid it by shopping around. This publication is not currently associated with any training series. Where did credit card checkout fees come from? What are your rights and retailers' responsibilities? What can you do about checkout fees? You may encounter a retailer surcharge, or “checkout fee,” when you use your credit card to buy goods and services. A 2012 court settlement between retailers and the payments industry allows retailers to pass their credit card acceptance costs onto consumers in the form of a new fee. Not all merchants will charge this fee—it’s up to individual business owners. The settlement terms took effect on Jan. 27, 2013. Make sure you know your rights – and the merchant’s responsibilities – before paying a fee to use your credit card! In 2012, a settlement was reached between retailers, nine major banks and Visa and MasterCard in a legal case over electronic payment costs. As part of the settlement, retailers now have the option to charge a checkout fee when you use your credit card. You need to know that there are important consumer protections built into the settlement. What are your rights and retailers’ responsibilities? Checkout fees are only permitted on credit and charge cards, NOT debit cards. Find contact information for your state attorney general at the National Association of Attorneys General website. Retailers only are allowed to charge a fee that is equivalent to what they pay to accept the card, which in the U.S. is typically between 1.5% and 3% of the total purchase, although a maximum fee of 4% is permitted. The disclosure on the receipt must list the amount of the checkout fee, the fact that the merchant is imposing the charge and that the fee is not greater than what it costs the retailer to accept credit and charge cards. Checkout fees can vary for different kinds of cards (such as rewards cards or premier cards) so be sure to ask your retailer in advance if different surcharges apply and choose your payment card accordingly. Be aware that while checkout fees are now allowed, retailers are not required to charge you extra for using a credit or charge card. Know your rights. There are rules in place to make sure merchants don’t surprise you with a fee at the last minute, try to hide the fee or overcharge you. Request a discount. If you believe that the cost of processing card payments has already been built into the price you are paying, you could ask the merchant for a discount if it also charges a checkout fee. Shop around to avoid checkout fees altogether. Support merchants and retailers that don’t charge a fee for using a credit or charge card. To learn more, visit Consumer Action’s Know Your Card website. 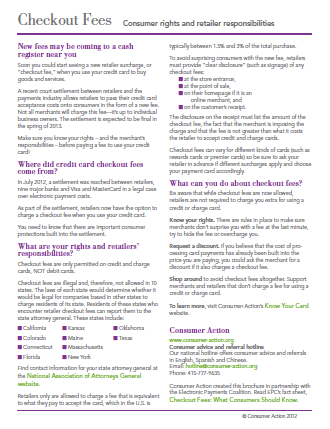 Credit: Consumer Action created this brochure in partnership with the Electronic Payments Coalition. Read EPC’s fact sheet, Checkout Fees: What Consumers Should Know. © 2012 –2019 Consumer Action. Rights Reserved.